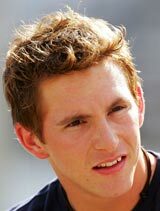 Scott Speed proved to be quite a controversial character during his two seasons in Formula One with Toro Rosso. Although he scored no points he made his mark by being outspoken and on one occasion got fined US$5,000 for using abusive language against David Coulthard in a post-race hearing. He came to F1 with an impressive record after winning Formula Renault championships in both Germany and Europe and finishing third behind Nico Rosberg and Heikki Kovalainen in the 2005 GP2 series. However, he struggled to translate that promise into points in F1 and was replaced by Sebastian Vettel midway through the 2007 season. He currently races in NASCAR with Red Bull backing in his native USA .